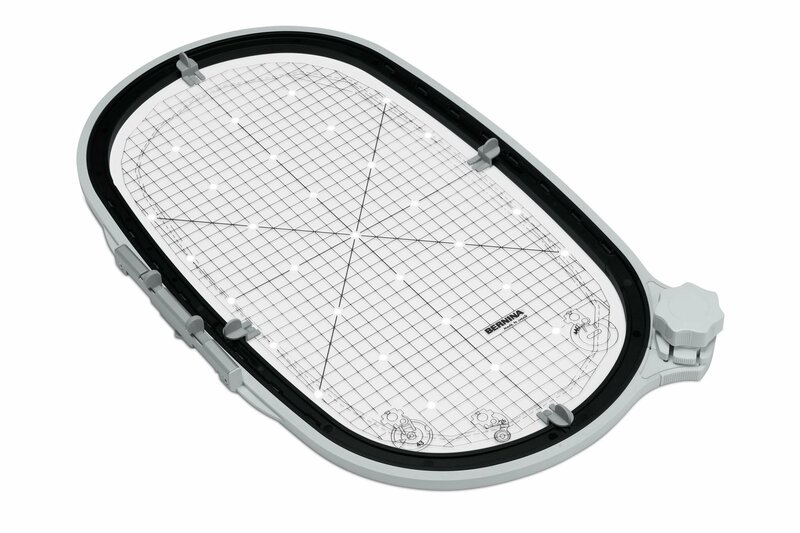 The Jumbo Hoop offers a range of advantages for embroidery projects be they easy or challenging. With a maximum embroidery area of 40 x 26cm (15 ¾” x scant 10 ¼”), this BERNINA hoop is ideal for large scale embroidery designs and design combinations. Borders are also a pleasure to embroider with this extra large hoop. Specially designed for the BERNINA 830, the Jumbo Hoop boasts an ergonomic mechanism that greatly simplifies the hooping and unhooping a range of fabrics. The "Jumbo" can also be used with the BERNINA 880, the 780/790 and the 750/770 QE, although with both of these models, the maximum embroidery area is limited to 40 x 21 cm. Another ultra-convenient aspect of the design: the entire embroidery area can be stitched out with no need to rotate the hoop.